In the guestrooms—done in a peaceful celadon with bright accents—you'll find two bottles of complimentary bottled water alongside the Archive bath amenities. 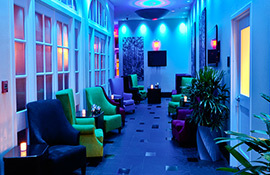 Wireless internet access is complimentary throughout the hotel, and there's a 24-hour business center in the lobby. Great service and New Orleans spirit begin the minute you arrive—you'll be greeted with a complimentary cocktail in VIVE! lounge. The fashionable interior of VIVE! lounge opens onto a quiet courtyard with plush loungers and atmospheric lighting. Well cocktails are just $4 during Happy Hour. The stylish executive meeting room accomodates 8 attendees; the lounge and cocktail area are available for receptions for up to 150. In the heart of the French Quarter, half a block from Bourbon Street, Hotel le Marais is walking distance to the city's famous restaurants, art galleries and jazz clubs. Whether planning a small executive meeting or a cocktail reception, Hotel Le Marais offers flexible arrangements to meet your needs with a meeting room that can accommodate an intimate executive meeting of 10, and an upscale bar and lounge area and courtyard that are sure to create a memorable event for a cocktail party or reception of up to 120 guests. Its sales and catering professionals will work with you to create an unforgettable event with our needs in mind.